When I left this book sitting around my coffee table, my sister remarked with incredulity, “What has happened to the Ikea catalog?” as she paged through it with questions percolating in her head how Ikea could have created such a mockery of their own kitsch-infested, funky, invigorating furniture catalog of the finest in Swedish furniture. Her questions were all settled, though, when I informed her it was Quirk Book’s newest satirical, campy, fun horror story, that takes place in Ikea’s fictitious competitor store. Yet, the furniture store of this story is an inventive amalgamation of all the odds and ends of our favorite Swedish Furniture store, Ikea. The story begins with a mysterious stain on one of the funky couches (characteristically stiff, of course, as many Ikea chairs are apt to be), and that sets off an exciting, fun mystery that has all the elements of your perennial cinema house horror story, with fun characters who playfully represent all the cliched personalities of retail stores. It is a fun, page-turning adventure, and will be enjoyed most by people, who love satirical horror romps, in the style of Cabin in the Woods. If you are expecting something more cerebral, you may want to look elsewhere, for Horrorstor succeeds as a great addition to the fun genre of horror comedy., or satirical horror. Sometimes, the book’s characters feel too stilted, and the dialogue can be a bit generic and dry at times, when the clever rubs at Ikea have worn thin. But, the book is thoroughly enjoyable, regardless of some of these not-so great elements that sometimes detracts from the charm and novelty of the story. 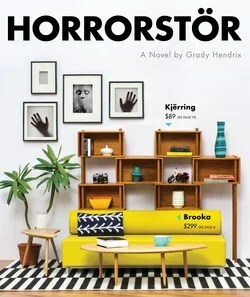 So, if you’re in the mood for deceiving people in your household (who regularly peruses Ikea catalogs while eating), you should buy this book, read and laugh up a storm at all the witty jokes about Ikea and horror conventionalities, and then leave the book lingering on your coffee table. It is the best way to spread the infectious fun of reading this book! Even better, leave the copy on a cheap Lack table, sitting unattended in your house, until the next curious passbyer in your home picks it up to read. Be sure to check out the perfectly quirky, camp-infested trailer for this novel! !